For the 1953 Ellery Queen novel, see The Scarlet Letters. For other uses, see Scarlet Letter (disambiguation). The Scarlet Letter: A Romance is a work of historical fiction by American author Nathaniel Hawthorne, published in 1850. Set in Puritan Massachusetts Bay Colony during the years 1642 to 1649, the novel tells the story of Hester Prynne who conceives a daughter through an affair and then struggles to create a new life of repentance and dignity. The book explores themes of legalism, sin, and guilt. The Scarlet Letter was one of the first mass-produced books in America. It was popular when first published and is considered a classic work today. It inspired numerous film, television, and stage adaptations. Critics have described it as a masterwork and novelist D. H. Lawrence called it a "perfect work of the American imagination". As Hester looks out over the crowd, she notices a small, misshapen man and recognizes him as her long-lost husband, who has been presumed lost at sea. When the husband sees Hester's shame, he asks a man in the crowd about her and is told the story of his wife's adultery. He angrily exclaims that the child's father, the partner in the adulterous act, should also be punished and vows to find the man. He chooses a new name, Roger Chillingworth, to aid him in his plan. The Reverend John Wilson and the minister of Hester's church, Arthur Dimmesdale, question the woman, but she refuses to name her lover. After she returns to her prison cell, the jailer brings in Roger Chillingworth, a physician, to calm Hester and her child with his roots and herbs. He and Hester have an open conversation regarding their marriage and the fact that they were both in the wrong. Her lover, however, is another matter and he demands to know who it is; Hester refuses to divulge such information. He accepts this, stating that he will find out anyway, and forces her to hide that he is her husband. If she ever reveals him, he warns her, he will destroy the child's father. Hester agrees to Chillingworth's terms although she suspects she will regret it. Following her release from prison, Hester settles in a cottage at the edge of town and earns a meager living with her needlework, which is of extraordinary quality. She lives a quiet, somber life with her daughter, Pearl, and performs acts of charity for the poor. She is troubled by her daughter's unusual fascination with Hester's scarlet "A". The shunning of Hester also extends to Pearl, who has no playmates or friends except her mother. As she grows older, Pearl becomes capricious and unruly. Her conduct starts rumors, and, not surprisingly, the church members suggest Pearl be taken away from Hester. Hester, hearing rumors that she may lose Pearl, goes to speak to Governor Bellingham. With him are ministers Wilson and Dimmesdale. Hester appeals to Dimmesdale in desperation, and the minister persuades the governor to let Pearl remain in Hester's care. Because Dimmesdale's health has begun to fail, the townspeople are happy to have Chillingworth, a newly arrived physician, take up lodgings with their beloved minister. Being in such close contact with Dimmesdale, Chillingworth begins to suspect that the minister's illness is the result of some unconfessed guilt. He applies psychological pressure to the minister because he suspects Dimmesdale is Pearl's father. One evening, pulling the sleeping Dimmesdale's vestment aside, Chillingworth sees a symbol that represents his shame on the minister's pale chest. Tormented by his guilty conscience, Dimmesdale goes to the square where Hester was punished years earlier. Climbing the scaffold, he admits his guilt but cannot find the courage to do so publicly. Hester, shocked by Dimmesdale's deterioration, decides to obtain a release from her vow of silence to her husband. Several days later, Hester meets Dimmesdale in the forest and tells him of her husband and his desire for revenge. She convinces Dimmesdale to leave Boston in secret on a ship to Europe where they can start life anew. Renewed by this plan, the minister seems to gain new energy. On Election Day, Dimmesdale gives what is called one of his most inspired sermons. But as the procession leaves the church, Dimmesdale climbs upon the scaffold and confesses his sin, dying in Hester's arms. Later, most witnesses swear that they saw a stigma in the form of a scarlet "A" upon his chest, although some deny this statement. Chillingworth, losing his will for revenge, dies shortly thereafter and leaves Pearl a substantial inheritance. After several years, Hester returns to her cottage and resumes wearing the scarlet letter. When she dies, she is buried near the grave of Dimmesdale, and they share a simple slate tombstone engraved with an escutcheon described as: "On a field, sable, the letter A, gules" ("On a field, black, the letter A, red"). 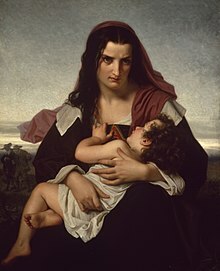 The major theme of The Scarlet Letter is shaming and social stigmatizing, both Hester's public humiliation and Dimmesdale's private shame and fear of exposure. Notably, their liaison is never spoken of, so the circumstances that lead to Hester's pregnancy, and how their affair was kept secret never become part of the plot. Elmer Kennedy-Andrews remarks that Hawthorne in "The Custom-house" sets the context for his story and "tells us about 'romance', which is his preferred generic term to describe The Scarlet Letter, as his subtitle for the book – 'A Romance' – would indicate." In this introduction, Hawthorne describes a space between materialism and "dreaminess" that he calls "a neutral territory, somewhere between the real world and fairy-land, where the Actual and the Imaginary may meet, and each imbues itself with nature of the other". This combination of "dreaminess" and realism gave the author space to explore major themes. The experience of Hester and Dimmesdale recalls the story of Adam and Eve because, in both cases, sin results in expulsion and suffering. But it also results in knowledge – specifically, in knowledge of what it means to be immoral. For Hester, the Scarlet Letter is a physical manifestation of her sin and reminder of her painful solitude. She contemplates casting it off to obtain her freedom from an oppressive society and a checkered past as well as the absence of God. Because the society excludes her, she considers the possibility that many of the traditions upheld by the Puritan culture are untrue and are not designed to bring her happiness. As for Dimmesdale, the "cheating minister", his sin gives him "sympathies so intimate with the sinful brotherhood of mankind, so that his chest vibrate[s] in unison with theirs." His eloquent and powerful sermons derive from this sense of empathy. The narrative of the Reverend Arthur Dimmesdale is quite in keeping with the oldest and most fully authorized principles in Christian thought. His "Fall" is a descent from apparent grace to his own damnation; he appears to begin in purity but he ends in corruption. The subtlety is that the minister's belief is his own cheating, convincing himself at every stage of his spiritual pilgrimage that he is saved. The rose bush's beauty forms a striking contrast to all that surrounds it; as later the beautifully embroidered scarlet "A" will be held out in part as an invitation to find "some sweet moral blossom" in the ensuing, tragic tale and in part as an image that "the deep heart of nature" (perhaps God) may look more kindly on the errant Hester and her child than her Puritan neighbors do. Throughout the work, the nature images contrast with the stark darkness of the Puritans and their systems. Chillingworth's misshapen body reflects (or symbolizes) the anger in his soul, which builds as the novel progresses, similar to the way Dimmesdale's illness reveals his inner turmoil. The outward man reflects the condition of the heart; an observation thought inspired by the deterioration of Edgar Allan Poe, whom Hawthorne "much admired". Another theme is the extreme legalism of the Puritans and how Hester chooses not to conform to their rules and beliefs. Hester was rejected by the villagers even though she spent her life doing what she could to help the sick and the poor. Because of the social shunning, she spent her life mostly in solitude and would not go to church. But Hester had been alienated from the Puritan society, both in her physical life and spiritual life. When Dimmesdale dies, she knows she has to move on because she can no longer conform to the Puritans' strictness. Her thinking is free from religious bounds and she has established her own different moral standards and beliefs. It was long thought that Hawthorne originally planned The Scarlet Letter to be a shorter novelette, part of a collection named Old Time Legends, and that his publisher, James Thomas Fields, convinced him to expand the work to a full-length novel. This is not true: Fields persuaded Hawthorne to publish The Scarlet Letter alone (along with the earlier-completed "Custom House" essay) but he had nothing to do with the length of the story. Hawthorne's wife Sophia later challenged Fields' claims a little inexactly: "he has made the absurd boast that he was the sole cause of the Scarlet Letter being published!" She noted that her husband's friend Edwin Percy Whipple, a critic, approached Fields to consider its publication. The manuscript was written at the Peter Edgerley House in Salem, Massachusetts, still standing as a private residence at 14 Mall Street. It was the last Salem home where the Hawthorne family lived. The Scarlet Letter was first published in the spring of 1850 by Ticknor & Fields, beginning Hawthorne's most lucrative period. 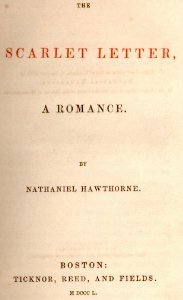 When he delivered the final pages to Fields in February 1850, Hawthorne said that "some portions of the book are powerfully written" but doubted it would be popular. In fact, the book was an instant best-seller, though, over fourteen years, it brought its author only $1,500. Its initial publication brought wide protest from natives of Salem, who did not approve of how Hawthorne had depicted them in his introduction "The Custom-House". A 2,500-copy second edition included a preface by Hawthorne dated March 30, 1850, that stated he had decided to reprint his Introduction "without the change of a word... The only remarkable features of the sketch are its frank and genuine good-humor ... As to enmity, or ill-feeling of any kind, personal or political, he utterly disclaims such motives". The Scarlet Letter was also one of the first mass-produced books in America. In the mid-nineteenth century, bookbinders of home-grown literature typically hand-made their books and sold them in small quantities. The first mechanized printing of The Scarlet Letter, 2,500 volumes, sold out within ten days, and was widely read and discussed to an extent not much experienced in the young country up until that time. Copies of the first edition are often sought by collectors as rare books, and may fetch up to around $18,000 USD. The following are historical and Biblical references that appear in The Scarlet Letter. Anne Hutchinson, mentioned in Chapter 1, The Prison Door, was a religious dissenter (1591–1643). In the 1630s she was excommunicated by the Puritans and exiled from Boston and moved to Rhode Island. Ann Hibbins, who historically was executed for witchcraft in Boston in 1656, is depicted in The Scarlet Letter as a witch who tries to tempt Prynne to the practice of witchcraft. Richard Bellingham, who historically was the governor of Massachusetts and deputy governor at the time of Hibbins's execution, was depicted in The Scarlet Letter as the brother of Ann Hibbins. Martin Luther (1483–1545) was a leader of the Protestant Reformation in Germany. Increase Mather, (1639, 1723) a powerful leader of the early Massachusetts Bay Colony. He was a Puritan minister involved with the government of the colony, and also the Salem Witch Trials. Sir Thomas Overbury and Dr. Forman were the subjects of an adultery scandal in 1615 in England. Dr. Forman was charged with trying to poison his adulterous wife and her lover. Overbury was a friend of the lover and was perhaps poisoned. John Winthrop (1588–1649), second governor of the Massachusetts Bay Colony. King's Chapel Burying Ground, mentioned in the final paragraph, exists; the Elizabeth Pain gravestone is traditionally considered an inspiration for the protagonists' grave. John Eliot (c. 1604–1690) was a Puritan missionary to the American Indians whom some called “the apostle to the Indians." He is referred to as "the Apostle Eliot" whom Dimmesdale has gone to visit at the beginning of Chapter 16, A Forest Walk. The Scarlet Letter A: In the beginning of the novel Hester's letter A is a representation of her sin and adultery. However, as time progresses, the meaning of the letter changed. It now represented, to some, able. It states “The letter was the symbol of her calling. Such helpfulness was found in her—so much power to do, and power to sympathize—that many people refused to interpret the scarlet A by its original signification. They said that it meant Able, so strong was Hester Prynne, with a woman's strength” (129). Dimmesdale's name: Dimmesdale's name itself also holds symbolism. His name contains the root word "dim" which evokes the feeling of faint, weak, and gloom. This represents the constant state Dimmesdale finds himself in. His life has dimmed itself ever since his sin, causing his light of life to fade and dim. Pearl: Pearl symbolizes the embodiment of her parent's sin and passion. She is a constant reminder of the sin her mother can't escape from. It is mentioned she "was the scarlet letter in another form; the scarlet letter endowed in life” (84). Rosebush: The rosebush is mentioned twice within the course of the story. At the beginning, it is first viewed as nature's way of offering beauty to those who leave and enter the prison as well as providing a glimmer of hope to those who inhabit it. The rosebush is perceived as a symbol of brightness in a story filled with human sorrow. The Scarlet Letter has inspired numerous film, television, and stage adaptations, and plot elements have influenced several novels, musical works, and screen productions. In March 2015, Manga Classics Inc. published a manga adaptation of The Scarlet Letter, was adopted by Crystal S. Chan, art by Sunneko Lee. While the manga kept the traditional black and white artwork, it highlighted the scarlet 'A' in the text by colorizing only this image on pages. ^ Hawthorne, Nathaniel (1850). The Scarlet Letter: A Romance (2 ed.). Boston: Ticknor, Reed and Fields. Retrieved July 22, 2017 – via Internet Archive. ^ "The 100 best novels: No 16 – The Scarlet Letter by Nathaniel Hawthorne (1850) | Books | The Guardian". ^ Kennedy-Andrews (1999), p. 8–9. ^ a b "The Scarlet Letter". Sparknotes. Retrieved 2012-08-07. ^ Parker, Hershel. "The Germ Theory of The Scarlet Letter," Hawthorne Society Newsletter 11 (Spring 1985) 11-13. ^ Wineapple, Brenda. Hawthorne: A Life. Random House: New York, 2003: 209–210. ISBN 0-8129-7291-0. ^ Wright, John Hardy. Hawthorne's Haunts in New England. Charleston, SC: The History Press, 2008: 47. ISBN 978-1-59629-425-7. ^ Crowley, J. Donald, and Orestes Brownson. Chapter 50: [Orestes Brownson], From A Review In Brownson's Quarterly Review." Nathaniel Hawthorne (0-415-15930-X) (1997): 175–179. Literary Reference Center Plus. Web. 11 Oct. 2013. ^ Wineapple, Brenda. Hawthorne: A Life. Random House: New York, 2003: 217. ISBN 0-8129-7291-0. ^ James, Henry (1901). Hawthorne. Harper. pp. 108, 116. ^ Schwab, Gabriele. The mirror and the killer-queen: otherness in literary language. Indiana University Press. 1996. Pg. 120. ^ a b c d e f Noble, Barnes &. "The Scarlet Letter (Barnes & Noble Classics Series)". Barnes & Noble. Retrieved 2018-06-04. Boonyaprasop, Marina. Hawthorne’s Wilderness: Nature and Puritanism in Hawthorne's The Scarlet Letter and "Young Goodman Brown" (Anchor Academic Publishing, 2013). Brodhead, Richard H. Hawthorne, Melville, and the Novel. Chicago and London: The University of Chicago Press, 1973. Brown, Gillian. "'Hawthorne, Inheritance, and Women's Property", Studies in the Novel 23.1 (Spring 1991): 107–18. Cañadas, Ivan. "A New Source for the Title and Some Themes in The Scarlet Letter". Nathaniel Hawthorne Review 32.1 (Spring 2006): 43–51. Kennedy-Andrews, Elmer (1999). Nathaniel Hawthorne: The Scarlet Letter. Columbia Critical Guides. New York: Columbia University Press. ISBN 9780231121903. Korobkin, Laura Haft. "The Scarlet Letter of the Law: Hawthorne and Criminal Justice". Novel: a Forum on Fiction 30.2 (Winter 1997): 193–217. Garrtner, Matthew. "The Scarlet Letter and the Book of Esther: Scriptural Letter and Narrative Life". Studies in American Fiction 23.2 (Fall 1995): 131–51. Newberry, Frederick. "Tradition and Disinheritance in The Scarlet Letter". ESQ: A journal of the American Renaissance 23 (1977), 1–26; repr. in: The Scarlet Letter. W. W. Norton, 1988: pp. 231–48. Reid, Alfred S. Sir Thomas Overbury's Vision (1616) and Other English Sources of Nathaniel Hawthorne's 'The Scarlet Letter. Gainesville, FL: Scholar's Facsimiles and Reprints, 1957. Reid, Bethany. "Narrative of the Captivity and Redemption of Roger Prynne: Rereading The Scarlet Letter". Studies in the Novel 33.3 (Fall 2001): 247-67. Ryskamp, Charles. "The New England Sources of The Scarlet Letter". American Literature 31 (1959): 257–72; repr. in: The Scarlet Letter, 3rd ed. Norton, 1988: 191–204. Savoy, Eric. "'Filial Duty': Reading the Patriarchal Body in 'The Custom House'". Studies in the Novel 25.4 (Winter 1993): 397–427. Sohn, Jeonghee. Rereading Hawthorne's Romance: The Problematics of Happy Endings. American Studies Monograph Series, 26. Seoul: American Studies Institute, Seoul National University, 2001; 2002. Stewart, Randall (ed.) The American Notebooks of Nathaniel Hawthorne: Based upon the Original Manuscripts in the Piermont Morgan Library. New Haven: Yale University Press, 1932. Waggoner, Hyatt H. Hawthorne: A Critical Study, 3rd ed. Cambridge, MA: Belknap Press of Harvard University Press, 1971. D. H. Lawrence, Studies in Classic American Literature: Chapter 7: "Nathaniel Hawthorne and The Scarlet Letter"
Wikimedia Commons has media related to The Scarlet Letter. Seabrook, Andrea (2 March 2008). "Hester Prynne: Sinner, Victim, Object, Winner". In Character: A six-month series exploring the great characters of American fiction, folklore and pop culture. (Opinion). All Things Considered. NPR. Retrieved 12 March 2019.